On the 14th (Sun), discover the deep blue sea with a scuba or snorkeling tour. On the next day, enjoy unforgettable views with a balloon tour and then let the kids burn off some steam at Muddy's Playground. For more things to do, ratings, traveler tips, and other tourist information, use the Cairns trip builder website . Atlanta, USA to Cairns is an approximately 27-hour flight. You can also do a combination of flight and train. The time zone difference moving from Eastern Standard Time to Australian Eastern Standard Time (Queensland) is 15 hours. Traveling from Atlanta in July, expect Cairns to be a bit cooler, temps between 79°F and 64°F. Finish your sightseeing early on the 15th (Mon) so you can drive to Port Douglas. Start off your visit on the 16th (Tue): identify plant and animal life at Wildlife Areas. Here are some ideas for day two: admire nature's wide array of creatures at Wildlife Habitat Port Douglas, take a pleasant ride with a tour on horseback, and then look for all kinds of wild species at Mossman Gorge. For photos, reviews, where to stay, and more tourist information, go to the Port Douglas journey builder . You can drive from Cairns to Port Douglas in 1.5 hours. Alternatively, you can take a bus; or take a shuttle. In July, daily temperatures in Port Douglas can reach 78°F, while at night they dip to 64°F. 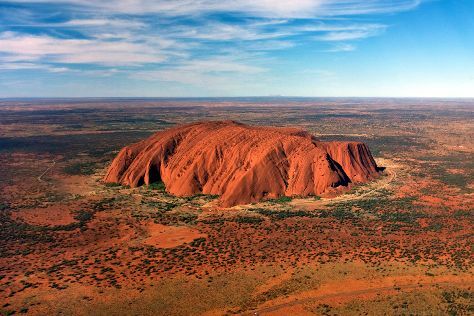 Cap off your sightseeing on the 17th (Wed) early enough to travel to Uluru-Kata Tjuta National Park. On the 18th (Thu), head outdoors with Walpa Gorge, take your sightseeing to a higher altitude at Kata Tjuta, and then see the world from above with a helicopter tour. On the next day, trek along Kuniya Walk, then contemplate the waterfront views at Mutitjulu Waterhole, then take in the dramatic natural features at Uluru, and finally tour the pleasant surroundings at Uluru Hiking Path. To find photos, maps, reviews, and more tourist information, you can read our Uluru-Kata Tjuta National Park travel route planner. You can do a combination of shuttle and flight from Port Douglas to Uluru-Kata Tjuta National Park in 6 hours. Another option is to drive. Traveling from Port Douglas in July, you will find days in Uluru-Kata Tjuta National Park are slightly colder (69°F), and nights are much colder (39°F). Wrap up your sightseeing on the 19th (Fri) early enough to travel to Katherine. Katherine is a town in Northern Territory, Australia. Kick off your visit on the 20th (Sat): take in the natural beauty of Katherine Hot Springs, then take a memorable tour with Tours, and then hike along Katherine Gorge. To find maps, photos, and other tourist information, read our Katherine trip builder . Traveling by flight from Uluru-Kata Tjuta National Park to Katherine takes 7 hours. Alternatively, you can do a combination of car and flight; or drive. Plan for a bit warmer temperatures traveling from Uluru-Kata Tjuta National Park in July, with highs in Katherine at 87°F and lows at 57°F. Finish your sightseeing early on the 20th (Sat) to allow enough time to drive to Darwin. Start off your visit on the 21st (Sun): get a dose of the wild on a nature and wildlife tour. Get ready for a full day of sightseeing on the next day: see the interesting displays at Defence of Darwin Experience, then identify plant and animal life at East Point Reserve, and then cool off at Wave Lagoon. To see photos, more things to do, maps, and other tourist information, use the Darwin trip itinerary builder tool . You can drive from Katherine to Darwin in 3.5 hours. Alternatively, you can take a bus; or fly. Expect somewhat warmer evenings in Darwin when traveling from Katherine in July, with lows around 67°F. Finish your sightseeing early on the 22nd (Mon) so you can travel to Broome. You'll discover tucked-away gems like Dolphin & Whale Watching and Cable Beach. Spend the 24th (Wed) wandering through the wild on a nature and wildlife tour. And it doesn't end there: get engrossed in the history at Broome Historical Museum, make a trip to Gantheaume Point, and look for all kinds of wild species at Malcolm Douglas Crocodile Park and Animal Refuge. For ratings, maps, other places to visit, and more tourist information, use the Broome driving holiday planning site . You can fly from Darwin to Broome in 6 hours. Other options are to drive; or take a bus. Due to the time zone difference, you'll gain 1 hour traveling from Darwin to Broome. Traveling from Darwin in July, expect little chillier with lows of 58°F in Broome. Finish your sightseeing early on the 25th (Thu) to allow enough time to travel back home.